Just when you thought it was over new images have popped up showing us even more Dino Chargers to add to your collection. Featuring all black Dino Buddies (…that’s our name for them) and two Legendary Rangers Dino Chargers, this set is probably something you’ll want to pick up if you’re collecting unique Dino Chargers. 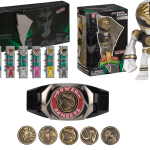 Each Red Ranger from each season is included in this assortment (except for Lauren) in a gold colored Dino Charger with their season’s emblem on the right and the two to three letter word abbreviation on the right. This is most confusing with Megaforce and Mystic Force, as they share the same abbreviation. No details yet on a release but rest assured we will see this set at San Diego Comic Con 2016. We’ll be there so be sure to follow us for all your up to the minute coverage at the show! Thanks to @razzle1337 for the find on the new Dino Chargers! Another month has come & gone and so have a number of toy galleries and in depth reviews by our Photo & Content staff! This month we took users on a trip that ranged from 2015’s Kamen Rider Ghost to 1973’s Kikaider 01! We also stopped in with a number of new Power Rangers galleries this month related to Dino Charge & Super Megaforce, with a dash of Zeo for good measure. And we made a special pit stop with a wonderful look at Kamen Rider Kiva! As with every month, we wanted to give you a variety of quality photos & reviews to enjoy. This one’s a little bit late but we’ve finally got a gallery and review ready to share of the NYCC 2015 Mighty Morphin Power Rangers Movie Dino Charger Power Pack! And we’ve also included the concurrently released Toys ‘R’ Us exclusive Ninja Mega Falconzord Charger in this gallery! The Movie Dino Charger pack is one supremely nice con exclusive as you’ll see in the photos attached to this article and in the full gallery. 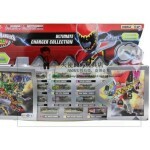 The packaging for this set is identical to the SDCC MMPR Charger Pack, all 6 Ranger Chargers are included and a spot is reserved on the end for the Ninja Mega Falconzord Charger. 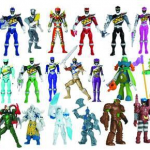 The 6 Movie Ranger Chargers feature the helmets, personal weapons, & Ninja Zords for each ranger as well as the Original Movie Logo within the rotating prism. While the Ninja Mega Falconzord Charger features a group shot of the team, the White Ranger Morpher & a full image of the Ninja Mega Falconzord itself! We’ve assembled 80 images of this magnificent set after the jump as well as an in depth review. But first why not check out this brief video below showcasing the sound effects that these chargers make when interacting with the Dino Charge Morpher! Click “Discuss on the TokuNation Forums” at the bottom of this post to see the full gallery and share your thoughts in the discussion thread! With these packaged samples turning up on the secondary market it’s probably a good indicator that they’ll be hitting actual retail in the near future! keep your eyes peeled and if you spot any of these new charged up items be sure to share your findings in our Toy Sightings Forum! Our annual trip to the world-famous San Diego Comic Con may be over, but our coverage is not! After getting those first-look images of the new Dino Chargers last week, we’re back but this time with high-resolution images of all the new (or at least what appeared to be new) chargers! 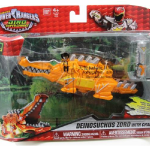 Check out over 30 images of BRAND NEW POWER RANGERS DINO CHARGE DINO CHARGERS by clicking the story link! Some of them look great! Please note – we’re not entirely sure what is 100% brand new and what isn’t – there have been so many variants out there it’s hard to keep track – so some of these may not be “ALL NEW”, but a lot of them are. Enjoy!